I am honestly at a loss for words for this next art show that I'm a part of. For anyone who knows me, Disney has been a huge part of my life. From some of my earliest memories watching The Wonderful World of Disney and my first trip (by train) to Disneyworld in Florida with my family to my wedding and reception behind Cinderella's Castle to visiting Tokyo Disneyland mulitple times. Not to mention all the movies and collectables, oh and that amazing 10th wedding anniversary lunch at Club 33! Like I said, I'm a huge fan of all things Disney. So when I got the email about the possibility of doing some artwork for the new WonderGround Gallery in the Downtown Disney® District at the Disneyland® Resort in Anaheim, CA, I started crying. Me? I was floored. I accepted and was given several characters to work with. Then it hit me - how the heck am I going to live up to all the great artists and artwork that Disney has produced? What could I possibly do to pay tribute to these characters? I worried for a bit then decided to keep it sweet and simple and hoped that I could do these lifelong 'friends' justice. In the midst of losing power for a week from Hurricane Sandy, and then another round of power outages from the nor'easter that dumped a foot of heavy wet snow just a week later, I was trying to get my artwork done. I just kept looking ahead to the day when I could share it with all of you. I've been waiting for the OK from Disney to announce the show and signing and low and behold, on my internet rounds this morning, I saw my Oswald piece on one of my favorite sites, Super Punch. He linked to the Disney Parks blog where they finally spilled the beans on the Good vs. Evil show, opening December 15th with signings in the morning from 9am to 11am featuring the amazingly talented J. Scott Campbell, Miss Mindy, Nei, Noah, Mike Stilkey, Sean Chao and Kristin Tercek (that's me!). Then in the 1pm - 3pm signing (which I will have to go back for since I really want to meet all of these artists) there's Stephanie Buscema, Martin Hsu, Jacki Huang, Jerrod Maruyama, Ming Ong and Michelle Romo. These artists are some of my all time favorites and I've been quietly following them for years. Now I have the amazing opportunity to show alongside them. I am humbled, honored and nervous as all heck! So many, many thanks to the people at WonderGround Gallery who found me and decided I might be a good fit. And to all my SoCal fans, it would be a real treat (and help me not be so nervous) if you came out to visit with me on the morning of December 15th at WonderGround Gallery. In Downtown Disney. In the Disneyland Resort. What a magical year this has been! 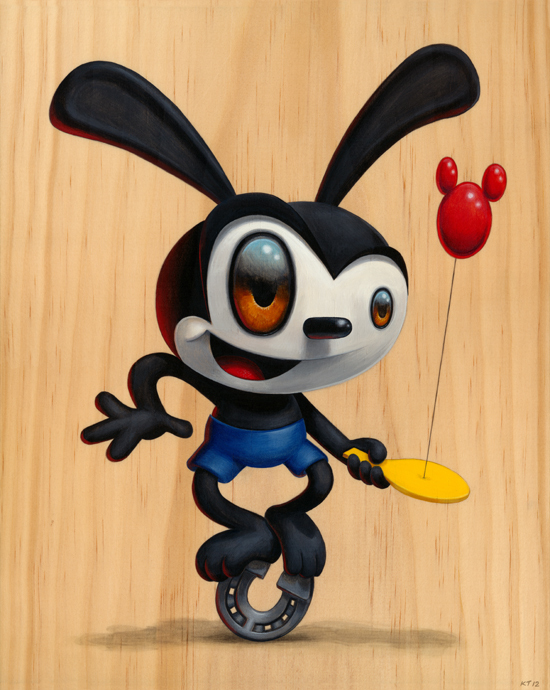 This is just one of the pieces I did for the show and it features one of my favorite characters, Oswald the Lucky Rabbit: "Multitasking" acrylic on wood 11.5" x 9.25". All of the original artwork and merchandise associated with this show will be available exclusively at WonderGround Gallery.